We left La Storta without eating breakfast. Sunday. All the bars were closed. At least it wasn't raining. We walked 3 kilometres to the next town, La Giustiniana, where we finally found a cafe up a side street that was open. Two cappuccinos. An apple and custard pastry. A cornetto al cioccolato. I filled up on sugar and warmth to keep soldiering on. We walked along the Via Cassia, hoping that we might be able to enter the nature reserve not long after exiting La Giustiniana but as the guide book pre-warned, the gate was locked and we continued along the road passing only apartment buildngs and shops and Sunday worshippers as they left church. Many many cars passed by us. 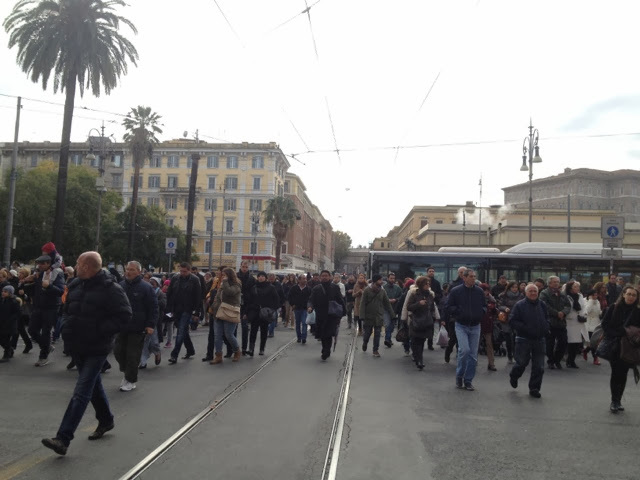 It was not a long walk into Rome but being sick, it felt long. After a couple of hours, my energy waned. We stopped for a rest break and second breakfast in a bar near Tor di Quinto. The toilet floor had been sprinkled with saw dust that had been trampled out into the midst of the bar. The idea of possible vomit beneath my feet did not make me feel better. After more coffee and yet another pastry I left the bar feeling full and warm and with more energy I started my final joyful march into Rome. We reached the river Tiber and it started to feel like we were almost in Rome. The river was spanned by old bridges and I could see on my map we were only 4.5 kms away. We walked alongside the river amongst Sunday strollers, joggers and bicycle riders. I glimpsed the great dome of St Peter's peeking above apartment buildings. I didn't feel any great surge of emotion. It just meant we were almost there. I walked faster. We continued alongside the Tiber until we veered off onto Viale Angelico, walking along the bike path that split the road down the middle. I renamed it the Pilgrim Expressway. 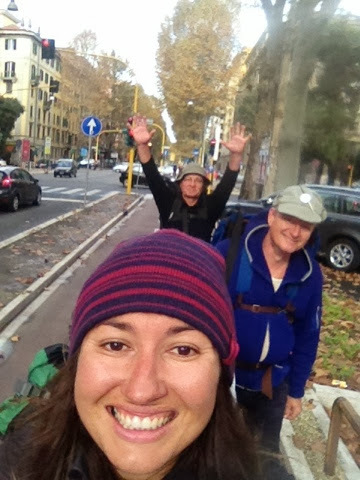 There was little bicycle traffic, a handful of pedestrians and then us three pilgrims marching towards St Peter's. 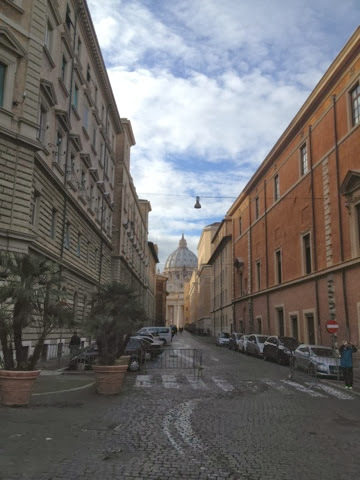 Just over a kilometre away from the Vatican which we still couldn't see, I started playing Daft Punk's "Lose Yourself to Dance" on my iPhone and started to dance walk my final steps into Rome. Peter joined in. Paulius laughed. 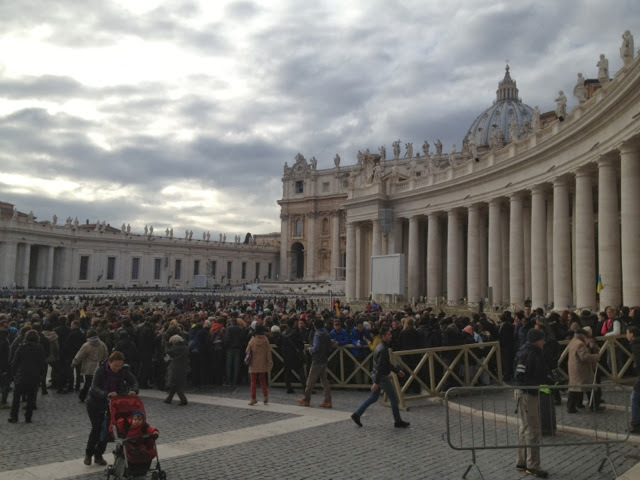 Even when we hit the crowds leaving the Vatican after Papa F's Sunday Mass, I kept dancing. This was a celebration. 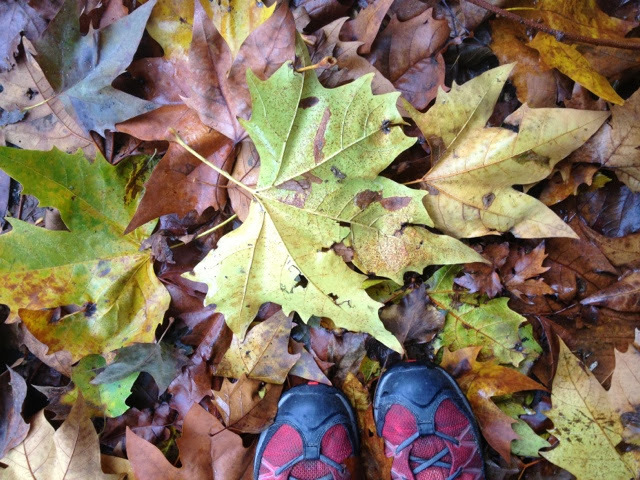 More than 2,000 kilometres walked, 12 weeks to the day I left Canterbury. I was arriving into Rome and I may have been dodging the Sunday worshippers but I wanted to dance, to be joyful, to celebrate this journey. We almost had to elbow our way into St Peter's Square there were so many people walking out towards us but we finally made it to the centre and stood before the imposing St Peter's Basilica amidst the tourists taking their holiday snapshots. We arrived. No fanfare. No welcome party. I did not cry. 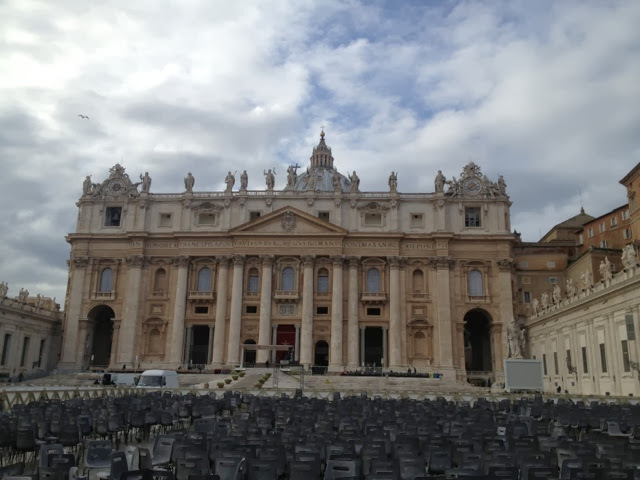 I just stood there in a fog of sickness feeling tired trying to comprehend that we were really there at the Vatican and I could stop walking now, almost. The office to obtain our final stamp for our pilgrim passports and official pilgrim certificate is closed on Sundays so it was a "now what?" kind of reaction. There was nothing else to do but find somewhere to sleep for the next couple of nights and some lunch. We found an outdoor cafe drenched in sunshine, close to the river that also had wifi. We ordered panini and wine and coca cola for Peter. We toasted ourselves and then set about finding accommodation for the night reading through notes and websites. I read messages of congratulations from family and friends and people I have never met but who have cheered me on along the way. My eyes filled with tears of gratitude and love but I wasn't in the right space to let them fall. 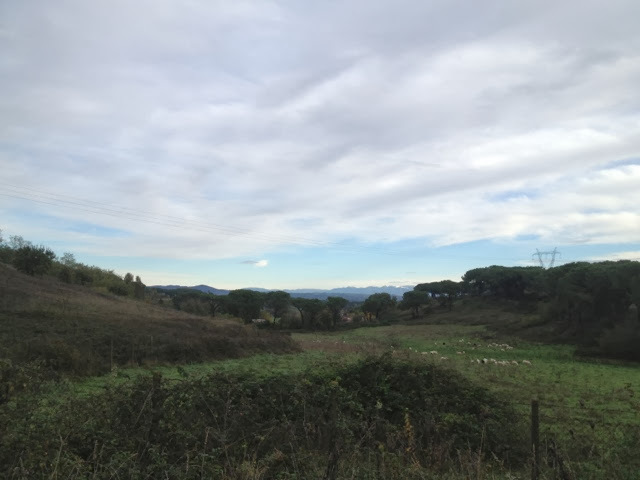 We found what turned out to be the perfect place to stay for the next two nights, the Spedale della Providenza e San Benedetto Labre cura di Confraternita di San Jacopo di Compostela. We were welcomed by the beautiful and vivacious Maria-Luisa and one of the nuns and ushered into our dorm room that we were to share with a frenchman, Fabian who had spent 6 months walking various ways from his home in Montpelier into Rome. Before dinner at 7.30pm, we were officially welcomed and blessed by the foot washing ceremony and prayer. That was when our pilgrimage officially ended. We had arrived. We were embraced by the open heart and love of the beautiful Maria-Luisa. We shared a meal with fellow pilgrims and guests of the convent. We were in Rome. The walking is over but the journey, not quite yet. Part of pilgrimage is to take the experience back home. I will not return to Melbourne until February and my pilgrimage, not my walking, will continue as I visit Scotland, the birth country of two of my grandparents, and return to Phuket, a place that has been so important in my own awakening. I arrived in Rome three days ago and am only writing this now having had neither the time, health or personal space to write. I have spent the last few mornings in the haze of sickness somehow still walking around Rome and then sleeping in the afternoons. It still feels surreal to think about how far I walked. 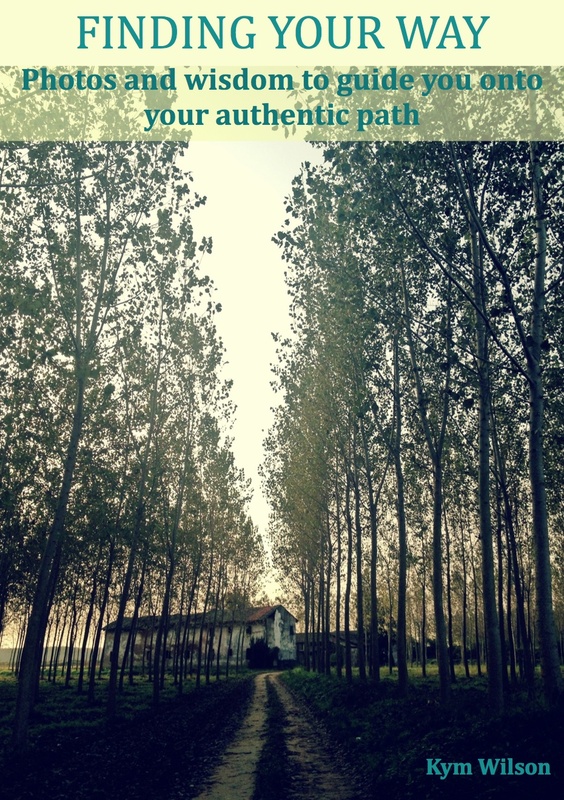 It is going to take some time to fully comprehend the magnitude of this journey. For 77 days, I got up in the morning, packed and set off into the morning light to walk into the world, into the unknown, to the next town. It was as simple and as complex as that and in doing so I walked from Canterbury to Rome. That is how all big things are accomplished by taking little steps. I look at the map of the path that I have walked and shake my head in disbelief at the enormity of the journey, that I really walked all this way, 2,000 kilometres. But I know I did it because I am here in Rome. Rome. 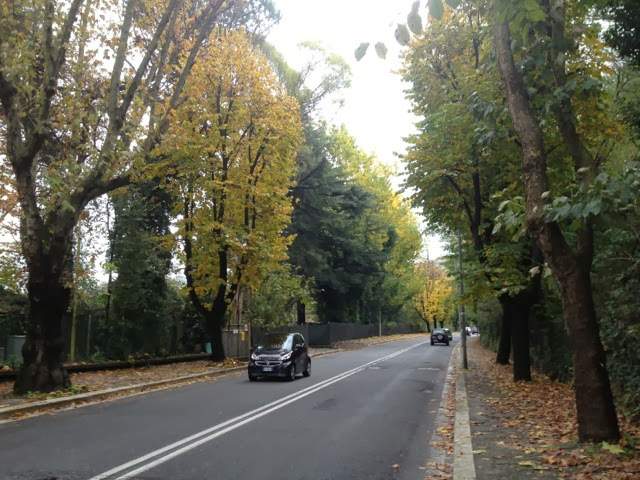 I roamed to Rome. I cried. I laughed. I danced. I trusted. I ate a lot of dolce to get here. 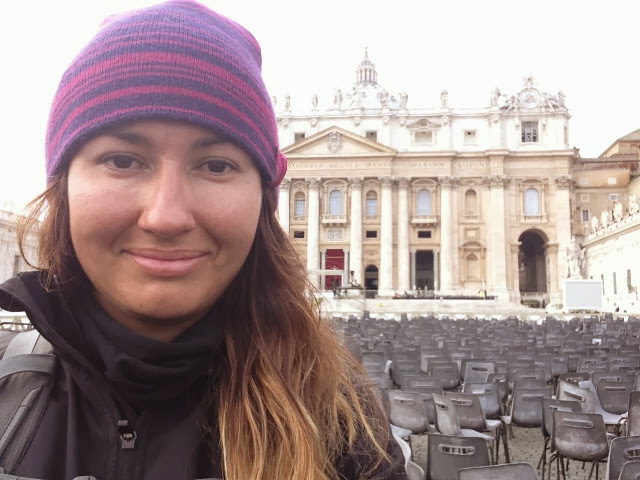 I walked from Canterbury to Rome. 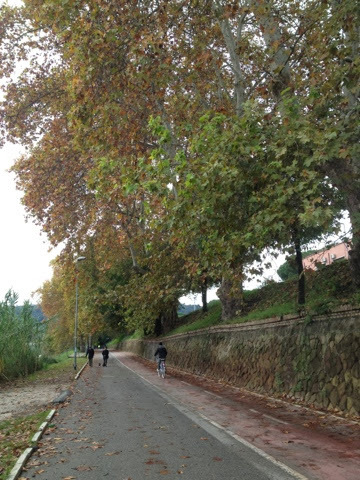 We walked along the Via Cassia, at least there were some pretty autumn trees. Then the river Tibe and this bridge I am not sure of its name. Walking along the pilgrim expressway. 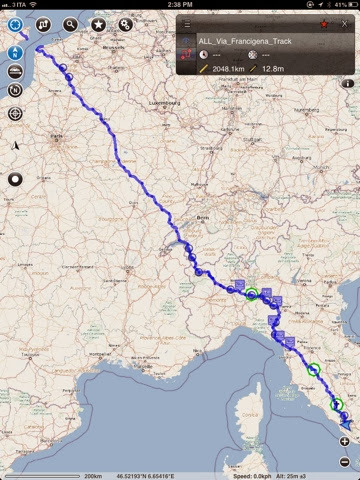 I walked all this way from Canterbury to Rome. How are you travelling? Literally splendidly, by the looks! Can you believe we're on the cusp of December? Well done, you have reached your goal. As you said, the pilgrimage is not yet over. The adventure inside your heart, not ready yet. Again, I would like to contribute to your cause. If you would like, maybe we could meet when you get back to Australia or please send me the bank details via email at: magnifico_28@hotmail.com. Take care and congratulations! You're very brave and inspiring!